when i was working at the custom correspondence shop in chicago i came across two invitations written in two languages. i know it sounds silly, but ever since i have always wanted a client who would ask me to do just that. so when i was following the links (i started at elizabeth anne designs and wound up at steeves photography blog) and i found this image i got so excited. the choice of fonts keeps the design simple in a text heavy invite, which is always tricky. and really what a beautiful way for the bride (jamaican) and the groom (italian) to incorporate their backgrounds into their paper goods. i would suggest taking a look at the rest of the photos from this event, i am currently obsessing over the tulle at the hem of the brides dress. ps the wedding was in venice. I'm American and my husband is Italian, we too had design our invitation in 2 languages. oh my, mr. boddington's studio did do a fabulous job. 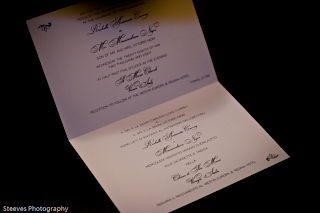 you invitation is beautiful. thank you so much for sharing! To language, seems they are foreigners and I think the priest also speak two languages.